Peggy did indeed get a career boost from three high-profile replacement gigs in a row, and she seemed off to a good start. Before we go on to consider why she replaced Carman, let’s pause a moment to see how Peggy’s career worked out for her. In a word, badly. She turned out to be another sad case — like Sidney Fox, whom she resembled in more ways than one. 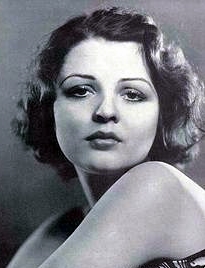 Born in Arkansas in 1907, she caught Florenz Ziegfeld’s eye while visiting her aunt in New York and became a Ziegfeld Girl at 16 in the Follies of 1923. 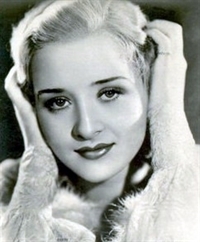 After a few dry years she started getting steady Broadway work in 1927, until Paramount’s B.P. Schulberg spotted her in Life Is Like That in 1930 and brought her west. 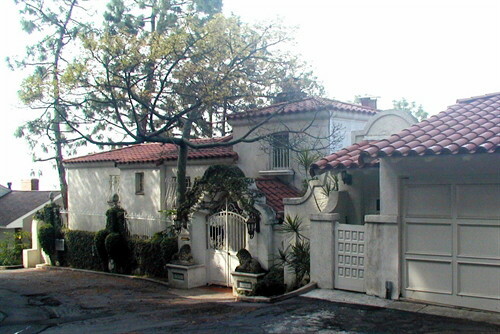 Peggy and Carman arrived in Hollywood about the same time (Schulberg may even have signed both deals on the same trip). Two days after Peggy’s arrival, Clara Bow suffered a nervous breakdown and Peggy was pulled off the bench to pinch-hit, apparently on her way to real stardom. 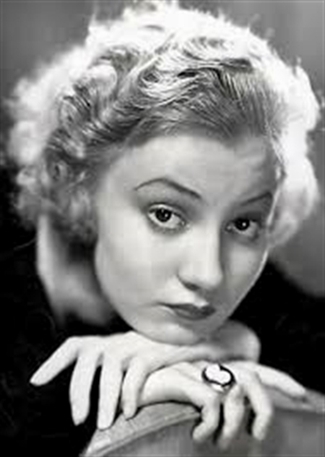 But not so fast — after a good couple of years at Paramount, she started bouncing from studio to studio: Warners to Columbia to MGM, with stopovers in between at various indie and Poverty Row outfits. Every step of the way she was followed by rumors of difficult behavior and alcohol abuse, which may explain why she never worked anywhere very long. Then it was back to Broadway in 1934 for Page Miss Glory. Perhaps significantly, when Peggy’s old studio Warner Bros. bought the screen rights to Page Miss Glory, they gave her part to Mary Astor. 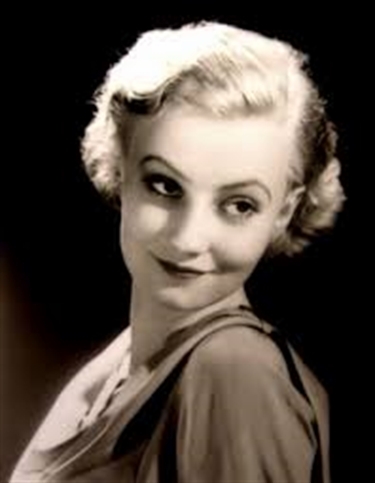 Peggy did one more play, got fired from yet another for drunkenness, then was back in Hollywood in 1936 for a parade of B-movies, bit parts and short subjects that kept her sporadically employed until 1940. In the meantime, she drank herself into a diseased liver and a fatal heart attack in May 1941 when she was 34. 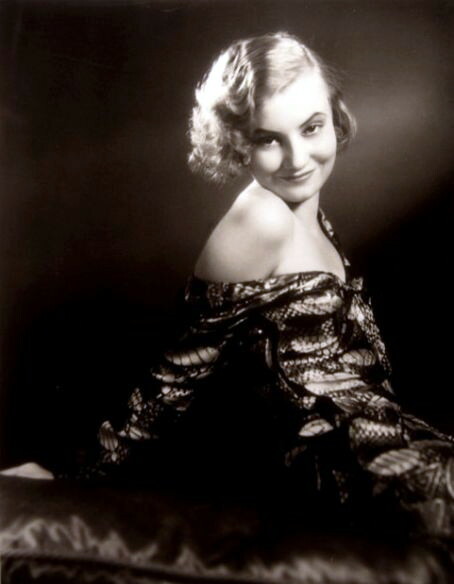 Less than three weeks later, her husband, Warners cameraman Al Roberts, shot himself in the same kitchen chair where he had found her dead body. He couldn’t bear to be separated from her, but in death he was: they were buried in cemeteries at opposite ends of Los Angeles. But back to Carman. What happened on The Road to Reno? That’s why I’d like a peek into the Paramount files. Cal York claimed that Carman’s first picture (which he still thought was Strangers and Lovers) was scheduled for an eight-week shoot (“The girl’s lines need much camera attention.”). But if we can believe Motion Picture Herald’s timeline, The Road to Reno was shooting from June 27 to August 1. Five weeks, more or less. And no sooner was it announced as “Completed” (with Carman still attached) than a list of names “On the Dotted Line” was published, with Peggy Shannon where Carman used to be. Can it be that Carman went through the whole shooting schedule, then Paramount, looking at a rough cut, decided to replace her and sent Peggy Shannon in immediately to reshoot her scenes? 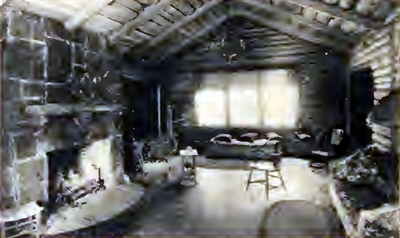 The Road to Reno was able to make its September 26 release date eight weeks later, so the studio couldn’t have let much grass grow under their feet. I suspect Peggy was Plan B all the time, with Paramount stringing along with Carman to see if she was going to work out, then finally deciding she hadn’t. What could have been the problem? The most obvious answer would be that she couldn’t act. But really, how bad would she have had to be? Have you seen Jean Harlow at the beginning of her career — in Hell’s Angels, for example? Or for that matter, Kim Novak in anything? No, I don’t think it was that. The Paramount bigwigs get a look at some footage of Carman, either in screen tests or actual rushes from The Road to Reno. Somebody — B.P. Schulberg, maybe, or Jesse Lasky — pipes up: “What’s with those eyebrows? She looks like she’s got a couple of spastic caterpillars on her face.” (What looks like a charming little mannerism sitting across from you in an interview, or even on the set, could look very different projected on a screen twenty feet wide.) Somebody takes Carman aside. “Honey, you’ve got this thing you do with your eyebrows. It looks weird in the rushes.” Carman is surprised and a little affronted; nobody’s ever complained about the way she talks, for God’s sake. But she politely thanks whoever it is, says she’ll fix it. But who knows? Maybe it wasn’t just the eyebrows — or maybe the eyebrows had nothing to do with it. Anyhow, it’s odd. By the beginning of August, by my count, Paramount had paid Carman $29,100 — hardly chickenfeed in 1931. Why would they write off that much money? To say nothing of shelling out who-knows-how-much more to reshoot with Peggy Shannon? About that same time, there was a bit player starting out at Pathé and MGM named Clark Gable; some people thought his ears were a deal breaker — but they still released the pictures he was in. Carman didn’t get even that much. And what about Carman the writer? Cal York said she couldn’t come up with a decent story. But maybe she did — or at least one that made it to the screen. 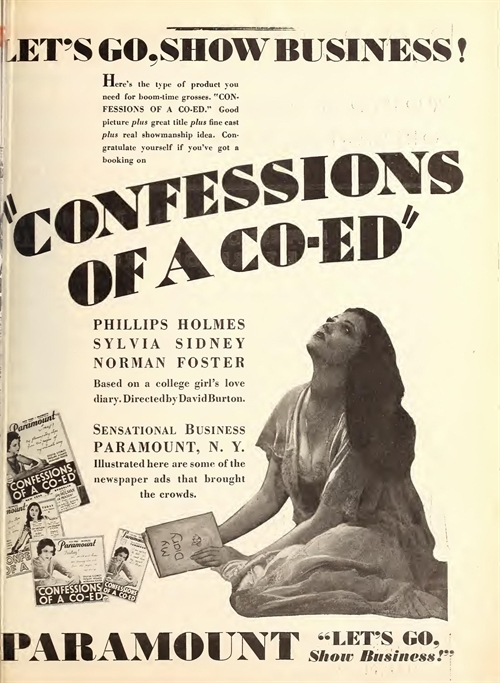 Midway through Carman’s tenure at Paramount, in June, the studio released Confessions of a Co-Ed with Sylvia Sidney, Phillips Holmes, Norman Foster and Claudia Dell. Not only is the title curiously similar to the Confessions of a Débutante (or A Débutante Confesses) that was supposed to be Carman’s first picture, but the story sounds like something she just might have made up. It’s a complicated tale of campus shenanigans. Pat (Sidney) loves campus Romeo Dan (Holmes) and gets pregnant by him. Through a series of misunderstandings, Dan leaves town and Pat traps his friend Hal (Foster) into marriage. Three years later Dan returns and everything comes to a head. The movie is memorable today mainly as an early bump in Sylvia Sidney’s career and for an appearance by Paul Whiteman’s Rhythm Boys (Bing Crosby, Harry Barris and Al Rinker) as themselves, playing a gig at a campus dance. But here’s the strange thing: the picture has no screenplay credit, not for dialogue or story; the closest thing to it is the blurb in this Motion Picture Herald ad (“based on a college girl’s love diary“). 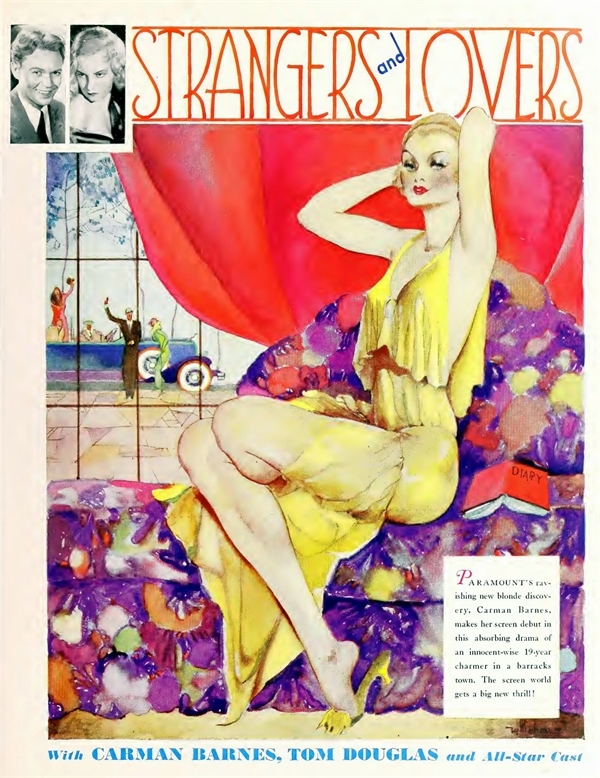 Could Strangers and Lovers (“…a tale of a girl who is afraid she is wicked…”; “…this absorbing drama of an innocent-wise 19-year[-old] charmer…”; “…a strong story of young love that will be long remembered…”) have somehow morphed into Confessions of a Co-Ed? Carman’s contract with Paramount Publix allowed the studio to do whatever they pleased with anything she wrote while she was on the payroll. 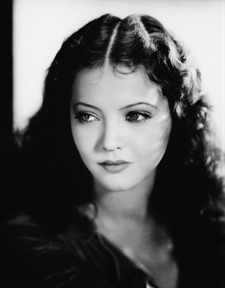 Did Carman, for the sake of $1,000 a week as the Depression took hold, swallow her resentment when Paramount handed her story off to Sylvia Sidney? Then did she swallow it again, when they cast her in a picture she did not write for herself? And when they replaced her in her first picture after she had already shot it — was that the last straw? Like the bit with the eyebrows, we may never know, but it’s a scenario I can easily imagine. Of course, I could be wrong. Maybe someday I’ll get a look at the Paramount archives and find out what really happened, and it’ll be simpler, or more complicated, than any of this. All I know now is whatever happened, Carman may have talked about it with family and friends but she never wrote anything down — at least, nothing that survives in her papers at the University of Rochester. “Just Dull Carman Barnes, who authored ‘School Girl,’ has produced ‘Mother Be Careful’ [sic] which Liveright has put between covers. In a general way the reader gets the impression that the book is supposed to be a satire on Hollywood. At least most of the action is laid there, but it is not very lively action. And that, friends, seems to have been Carman Barnes’s last word on the matter. Does Mother, Be Careful! “tell tales”? Well, maybe. Goldie Bromberg, if you squint at the character sideways, could almost be a near-libelous caricature of B.P. Schulberg, and there’s a pompous martinet director named Josef von Gluck who could even more easily pass for a spoof of Josef von Sternberg, Paramount’s reigning director of the day (C.B. DeMille having temporarily decamped) and no stranger to pomposity himself. “What is the secret of a sub-deb?” Goldie demanded with intense interest. The supervisors held their breath. Daisy knew her fate hung on her answer. She opened her wide surprised eyes. “Why—the secret of a sub-deb is that she doesn’t wear a brassiere,” she said. A sudden quiet descended. Ominous. Profound. Then a light dawned in Goldie’s eyes. He stared at Daisy with astonished pleasure. The supervisors leapt to their feet. “Marve-lous. Marve-lous, Let me congratulate you!” said von Gluck. “What is your name again?” asked Goldie. “Just Daisy,” said Daisy brightly. “What has chewing gum to do with writing?” asked Daisy. By the end of Mother, Be Careful!, little by-and-wither Daisy is gone from Hollywood with a sigh of bemused relief — no doubt much the same way by-and-wither Carman was gone by the end of 1931. Gone, but not forgotten — not quite and not just yet. Throughout the first half of 1932, Carman’s name kept cropping up in this or that magazine as some sort of cautionary tale. 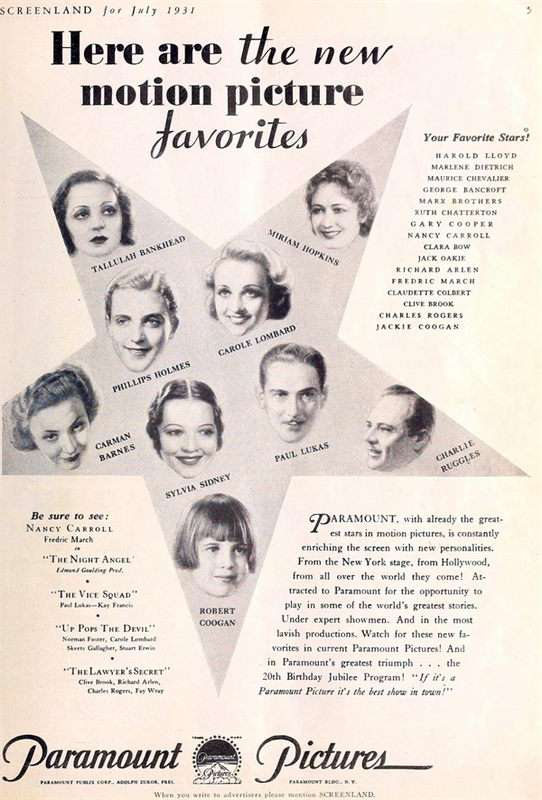 In the July Motion Picture an article by Sonia Lee on the burgeoning stardom of Clark Gable quotes Paramount casting director Fred Datig as saying that a studio can’t make stars — that the public does that. “If there is ability in a player and it shows quickly — then the studio is in luck,” says Datig. “If we find that either we can’t bring it out, or that we might have been mistaken, then the player is let out.” This can only have been a sidelong reference to Paramount’s washing its hands of Carman. But what’s that business about only the public making a star? Doesn’t that imply that only the public can decide when someone’s not going to be a star? The public never got to make that call. Or did they? Here’s another imaginary scenario: Was The Road to Reno completed and previewed with Carman? Did the preview go so badly that the studio immediately replaced her, commenced reshooting, and hustled her out the Marathon Street gate as fast as they could buy out her contract? It seems unlikely; no hint of a bad preview appears in any of the magazines at the time, and ever since then nobody has known enough to ask. But it might explain Fred Datig’s cryptic comment about the public’s veto power on stardom. Who was this “exotic newcomer” the item compared to vanished, banished Carman? The timing might be right for her to be Sari Maritza (pronounced “Sha-ree Ma-reet-zah”). That’s her on the left; can you see a “slight resemblance” to Carman? 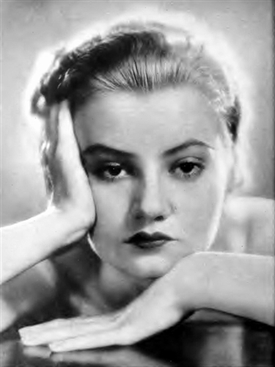 Anyhow, she is mentioned by name elsewhere in that same issue as “the ‘second Dietrich’ whom Paramount has under contract” — and who, like Carman a year earlier, “has been here months without starting [a single picture].” By 1932, Paramount was feeling that Marlene Dietrich had gotten too big for those sleek men’s britches she so often wore, and apparently had plans to groom Sari as a replacement. Miss Maritza did eventually appear in a handful of Paramount features, but she turned out not to be star material — and worse, she wasn’t even German. 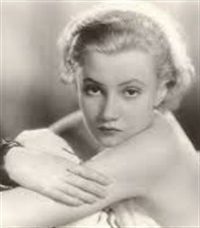 She had made pictures in Germany and was fluent in a number of European languages, but her real name was Dora Patricia Detering-Nathan, born in China to a British Army officer and his Austrian wife, and about as exotic as Picadilly Circus. After that, except for Variety’s pan of Mother, Be Careful!, the Hollywood record falls silent about Carman Barnes. 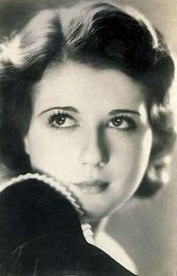 In just under 22 months she had gone from bestselling literary prodigy…to Broadway playwright…to the Next Clara Bow…to an answer in a trivia quiz by Marion Martone…to the punchline of a Jack Oakie wisecrack. And as far as I’ve been able to tell, that suited her just fine. She was not yet 20 years old. Carman Barnes’s movie career may have gone precisely nowhere, but she deserves a place in the history books for her unprecedented Hollywood contract. Never before had a major studio signed a woman to write and star in her own pictures. Given the outcome, it wouldn’t be surprising if it never happened again — but it did, the very next year (1932) and at the very same studio (Paramount). This time the woman in question was Mae West — and this time she made it into the history books. More than one fan magazine reported (like that June Motion Picture item quoted above) that after leaving Hollywood Carman wound up playing ingenues on the stage. If so, it must have been in regional theaters rather than New York, because I’ve been unable to find any details. Maybe she did a play or two as a lark, or just to be able to say she did it. In any case, Carman and her mother Diantha wound up back in New York, where Carman promptly exorcised her Hollywood sojourn by writing Mother, Be Careful!. 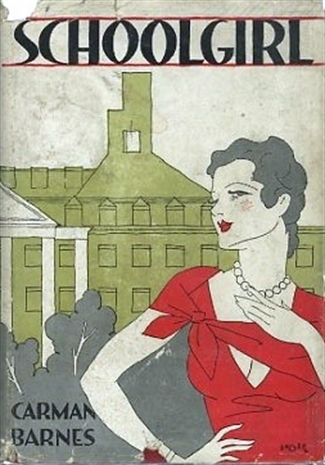 For her next novel, in 1934, Carman brought back Naomi Bradshaw, the heroine of Schoolgirl. Young Woman picks up Naomi as she moves to New York; the Depression has wiped out her family’s prosperity, driving her father to suicide and her mother to despair. Naomi has moved to New York to make her own way and, if possible, rebuild her family’s fortune — if not by marrying well, then by being well-kept. Having produced four novels in five years, Carman ceased publication for over a decade. But she never stopped writing. Throughout the 1930s, she dabbled in a number of esoteric pursuits, sometimes as a dilettante, sometimes as a serious student. 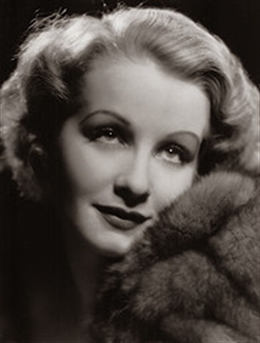 For a while in the late ’30s she was engaged to the aviation and automotive industrialist Vincent Bendix, 31 years her senior. In 1936, Carman and her mother collaborated on a musical play curiously titled Gentlemen, the Queel!, which was never produced. Mother Diantha died in 1939, age 50. She and Carman had always been a matched pair; neither Carman’s biological father, James Hunter Neal, nor either of her stepfathers — Wellington Barnes, who died when Carman was 15, and George Pullen Jackson, who lived until 1953 — seem ever to have been a major presence in her life. Neither, evidently, was her husband, Hamilton Fish Armstrong. 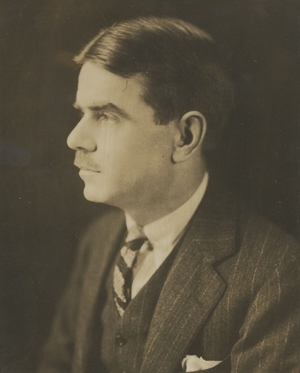 A scion of the politically influential Fish family, Armstrong was a founding editor of Foreign Affairs, the journal of the Council on Foreign Relations. He and Carman married in 1945, when he was 52 and Carman was 32 — like Bendix, old enough to be the father Carman never had. They collaborated on a play, The Passionate Victorian, about the British actress Fanny Kemble, which (like Gentlemen, the Queel!) was never produced. The couple separated in 1949 and divorced in 1951. All through the 1940s Carman was a voluminous and tireless correspondent on all the eclectic and esoteric topics that interested her. 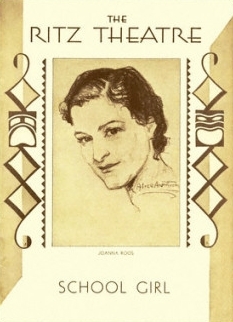 Her papers at the University of Rochester are stuffed with letters to and from such personages as conductor Leopold Stokowski, literary editor Maxwell Perkins, stage designer Norman Bel Geddes, actress Estelle Winwood, Natacha Rambova (Rudolph Valentino’s ex-wife), and her old school chums Clara Jackson Martin and Mary Jackson St. John. 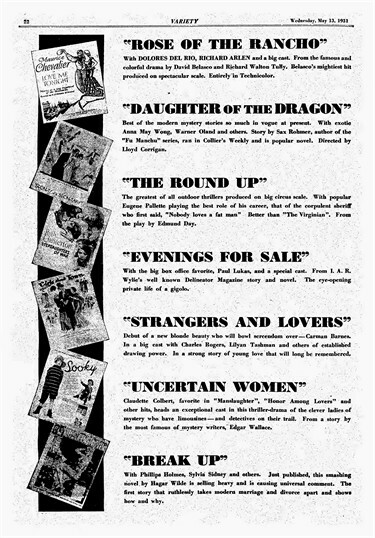 After ten years of publishers’ rejections of various works — and those unproduced plays written with her mother and husband — Carman’s fifth and final novel, Time Lay Asleep, was published by Harper & Bros. in 1946. It was a densely stylish but rambling and all-but-plotless tale of a family of Tennessee women raised by their soft-spoken but autocratic mother to need men even as they despise them; in their individual ways, all of them achieve unhappiness. Carman continued to write — especially letters — but she never published another word. Back in those early heady days in Hollywood, Carman had told interviewers of her urge to travel (“I’d love to see Europe.”), and her intention one day to marry and have children (“I wouldn’t miss that experience for anything.”). Alas, that experience — motherhood, that is — was denied to her. And four years with Hamilton Armstrong seems to have provided enough marriage to last the rest of her life. But the traveling — that urge, she was able to indulge. She left America in 1949, returning in 1951 only long enough to finalize her divorce from Armstrong, then sailing back to lead an expatriate’s life in Salzburg, Austria. 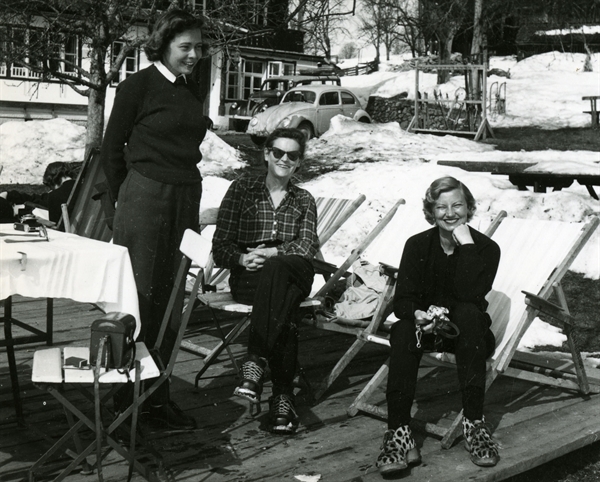 Here she is in an undated photo, probably from about 1955, relaxing on the sundeck of the Tennerhof Hotel in Kitzbühel, Austria with her friends Mary Nelson (left) and Therese Bogdanowicz (center). I’m sorry to have to report that Carman’s last decades appear to have been, on balance, less happy than she appears in this picture. Her biographical sketch on the Web site of the University of Rochester’s River Campus Libraries tells us that in the summer of 1952 she suffered “the first of several breakdowns”, and was treated with “insulin shock therapy and psychotherapy, among other methods.” She never returned to the U.S. and died at 67 on August 19, 1980 in Salzburg, where she is buried. 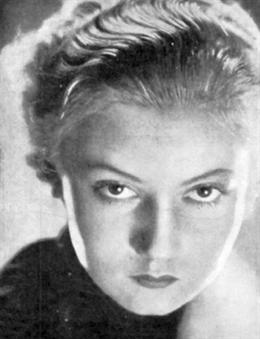 That biographical sketch also reports that in later years, speaking of her months in Hollywood, “she would tell interviewers that she was never given any writing work to do and that while she was photographed ‘700 times in the first week’, she was never given the opportunity to act in a film.” The fan magazines and trade publications of 1931 and ’32 tend to confirm what she said about those 700 photographs, but it seems to me they belie her assertion about never getting a chance to act. She certainly glossed over the episode of The Road to Reno. Maybe getting canned from that picture bothered her more that she wanted to let on, then or later. And I’m not entirely convinced, either, that her stint as a Paramount writer came to nothing. Confessions of a Co-ed strikes me as having too many intersecting points with Carman’s various announced-but-never-made projects — to say nothing of Schoolgirl, novel and play — to be purely coincidental. And there’s the curious fact of Confessions going out without any writer’s credit at all. If Carman didn’t write it, who did? Ah well, not that it matters — nobody, even in 1931, seemed inclined to brag about that one. 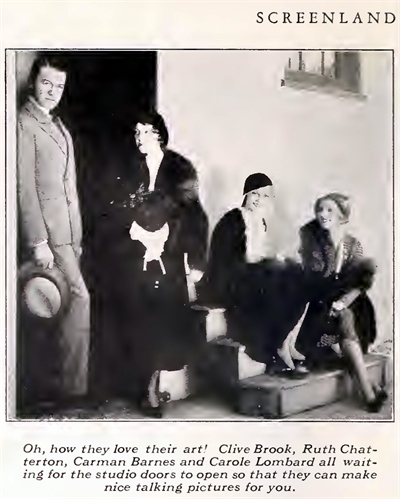 No doubt Sylvia Sidney and Phillips Holmes wished their names weren’t on it. If that was the way Carman remembered it…well, she was there and I wasn’t, and everybody is past asking about it now. Anyhow, I choose to close this series with the picture that opened it. This is the way I like to think of Carman — pensive, placid, expectant, and very pretty. It’s this photo that makes me wish we had something, even one movie, to give us some idea of why so many people, for a while, took it for granted that she was headed straight to the top. POSTSCRIPT: I mentioned this in the acknowledgments at the beginning of these posts, but now, at the end, I want to express once again my gratitude to Andrea Reithmayr, curator of the Carman Barnes Papers in the Department of Rare Books, Special Collections and Preservation at the University of Rochester’s River Campus Libraries. Andrea was always prompt and patient with my inquiries, and generous in providing documents and photographs from Carman’s life and career (the Libraries purchased Carman’s papers from Clara Martin, Carman’s lifelong friend and heir). “I am always glad when Carman gets some attention,” Andrea wrote me. I hope this attention has pleased her.